The pitch on which Paul DeJong broke his hand. ST. LOUIS — If it seems as though the St. Louis Cardinals‘ disabled list is getting crowded, it is. 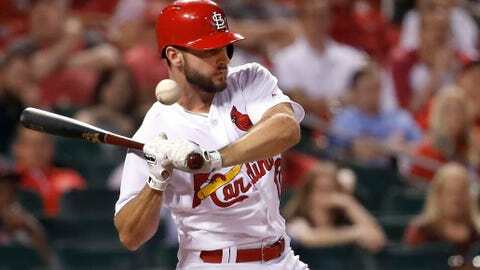 The Cardinals placed two more players on the 10-day disabled list Friday: shortstop Paul DeJong (fractured left hand) and right-hander Matt Bowman (blisters on right index and middle fingers). Bowman’s designation is retroactive to May 17. The Cardinals’ disabled list has swelled to 10 players, with seven of those players joining the list in the past 10 days. DeJong, the lone player to have appeared in all 41 Cardinals games this season, broke his hand when he was hit by a pitch in the eighth inning of Thursday night’s loss to the Phillies. DeJong is batting .260 with eight home runs and 19 RBIs this season, and he leads the team with 71 total bases. Bowman, who led the Cardinals with 75 appearances last season, is 0-1 with a 5.82 ERA and 20 strikeouts in 17 innings (17 games) this season. The club recalled infielder Yairo Muñoz and outfielder Tyler O’Neill from Triple-A Memphis to restock the major league roster. Muñoz, who made the team out of spring training, batted .111 (2 for 18) in 11 games with the Cardinals in April. He made three starts at third base. He has started games at shortstop, second base, third base, left field and center field for Memphis, where he was hitting .287 with three homers and 13 RBIs. O’Neill also debuted with the Cardinals earlier this season, appearing in six games. He ranks among the Pacific Coast League leaders with 13 homers (second), 31 RBIs (tied for sixth), a 1.041 OPS (sixth) and a .319 batting average (15th).